After a week where nothing seems to go right—you're majorly stressed about work, you haven't done laundry in so long that you're out of clean underwear, and the weather feels like anything but spring—the best medicine is undeniably some delicious comfort food. I love making a big batch of my Springtime Turkey Chili because it freezes exceptionally well and tastes even better by the second or third day. 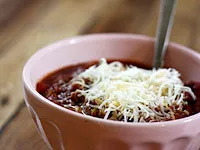 When I was growing up, my mom used to serve this chili over a big pile of steaming hot macaroni noodles and sprinkle cheddar cheese over the whole thing. My brother and I would scrape our bowls clean and go for seconds every time. Looking for something equally comforting and fancy? Try my friend Rocky's Chicken Marsala. It's perfect for a Friday night dinner with friends and comes together in only about 20 minutes, leaving you more time to enjoy a nice glass of wine at the end of the week and some downtime out of the kitchen. This recipe comes from my very good friend, Rocky. He's not afraid of butter—this recipe calls for half a stick—and that's what makes the sauce taste so rich and decadent. I save this indulgent meal for a cozy Friday night in with friends after a particularly long week. It's perfect paired with a glass of your favorite Chardonnay. 1. Slice each chicken breast in half like you're cutting a new hamburger bun. Place some plastic wrap over your cutting surface, then put the chickens on the plastic wrap. Then put more plastic wrap on top of the chickens. Now beat each slice with a meat mallet until they are only about one half-inch thick. Set aside and wash your hands. 2. Place the flour on a plate and spread it evenly. Add the oregano, and salt and pepper and mix well. 3. Heat a cast-iron pan on high then add the olive oil and the butter. The olive oil raises the burning temperature of the butter and also adds another element of richness to the dish. Keep a watchful eye on the pan and the second that the butter is all melted, throw all the chicken breasts in the pan and sear on each side. 4. Turn the heat down to medium and when the bottom of the chickens are done, add the mushrooms, garlic, rosemary, and wine. Cook about 6 to 8 minutes, or until the chicken is done and the sauce has thickened up a bit. This is a wonderful throw-together lunch that keeps for several days in the fridge. It's a hearty combination of complex carbs and lean protein that will keep you full for hours! 1. Cook the pasta in boiling salted water. Drain and rinse with cool water. 2. 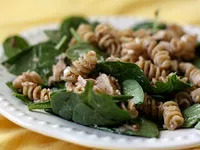 In a large bowl, combine the pasta, tuna, feta, olives, and spinach, tossing well. Drizzle the olive oil and vinegar and season with freshly ground pepper. Who says you have to wait till football season for your chili and cornbread? Not this misplaced Southerner. When you're feeling a little down, eating a big bowl of this chili is the surest way to pick yourself back up. 1. In a large pot, heat the olive oil over medium heat. Add the chopped onions, bell pepper, and jalapeño and cook for about 6 minutes, or until the vegetables have started to soften. Add the garlic and cook briefly for another 3 minutes. 2. Add the ground turkey and cook until the meat has browned, about 8 or 9 minutes. Be sure to keep stirring so everything cooks evenly. 3. Add the chili powder, cumin, oregano, and brown sugar and stir well. Next, add the tomato paste and give it another strong stir so everything is coated. Cook for 5 minutes, stirring constantly. 4. Add the wine and bay leaves, cover and let simmer for an hour. After the hour is up, take off the lid and simmer for another 30 minutes before serving. *This chili is best made the day before so the flavors can intensify. I love my bowl topped with cheddar cheese and cornbread, of course!